6 Calcium and Osteoporosis Myths Debunked – Nanova Tech Inc.
Calcium deficiencies creeps up on people mostly unnoticed, with most people not realizing they have serious low bone density until they’ve had their first fracture or break. Here are some common misconceptions debunked. MYTH #1: Osteoporosis isn’t that common. An estimated 10.2 million older Americans over the age of 49 have osteoporosis, and another 43.4 million more have low bone density, which puts them at risk for osteoporosis. One in 6 Caucasian women will experience a hip fracture in their lifetime. And 35 percent of African American women over 50 have low bone mass, a precursor to osteoporosis. MYTH #2: Osteoporosis doesn't affect men or young women. Osteoporosis occurs after a long period of gradual bone loss, and though fractures occur later in life, the disease has its onset many years earlier. And while osteoporosis does affect older women far more than it does men, an estimated 10 to 25 percent of men develop osteoporosis during their lifetime. Men tend to suffer osteoporotic fractures about 10 years later in life than women, but they’re more likely to get fractures of the hip than women. Meanwhile, younger women may develop osteoporosis or osteopenia if they also have one of these 8 medical conditions that raise their risk. MYTH #3: You don’t need to worry about osteoporosis if it's only a minor break. Having a low trauma break—which is defined as trauma equal (or less than) falling from a standing position—may be a sign of low bone density. On the other hand, if you break a bone during a more traumatic fall, say you fall when skiing or riding a mountain bike, it’s less likely to be a sign of osteoporosis. Your MD won’t be able to tell if you have low bone density from an X-ray (unless you have very advanced osteoporosis). You’ll need to get a DEXA scan. MYTH #4. Taking calcium supplements is just as good as eating foods with calcium. Experts recommend you first try to get calcium from food. Good sources of calcium included low-fat milk, cheese, yogurt, sardines and eggs. You can also take a calcium supplement along with vitamin D (D helps you absorb the calcium). Try to estimate how much calcium you get in your diet and then fill in the rest with a supplement. MYTH #5: If you eat dairy and exercise, you are not at risk for osteoporosis. Drinking milk, eating dairy and exercising can help keep prevent against bone loss. But genetics stills play a role—some people are more susceptible to bone loss than others, says Robert Recker, MD, professor of medicine, and director of the Osteoporosis Research Center, Creighton University. MYTH #6: If you have osteoporosis, it’s too late to protect your bones from fractures. Weight-bearing exercise has been shown to reduce the risk of fracture by strengthening bones and improving balance. You can further slow bone loss with medications, such as bisphosphonates and calcitonin. Some medications have shown up to a 68 percent reduction in hip fractures in women taking them. Hormone therapy can also slow the rate of bone loss, and even allow your body to rebuild bone. Rebalance your calcium intake. There are many calcium-rich vegetables that do double-duty for the bones by alkalizing the system. Beans and other legumes, such as soy, as well as fish, seeds, and nuts, offer additional choices. See the table above for some of our favorite nondairy calcium-rich foods. Let the sun shine in! Our bodies were meant to be exposed to sunshine — but do this in a way that is health-enhancing, not harmful. This will allow your body to make adequate amounts of vitamin D3 (cholecalciferol). Supplement with vitamin D. For maintaining adequate levels of vitamin D, 1000–2000 IU per day is safe and adequate. If you think you could be vitamin D-deficient — as are some billion people worldwide — ask your healthcare provider for vitamin D testing, then supplement accordingly. Increase your intake of vitamin K. Most people get some, but not enough vitamin K from their diet (from green leafy vegetables and fermented foods like aged cheese). As a whole, however, we consume suboptimal amounts of this key bone nutrient. For optimum bone health, supplementation with vitamin K2 is recommended for nearly everyone. Exceptions include those using the blood-thinning drug Coumadin (warfarin), as this vitamin can interfere with the action of blood-thinner drugs. Again, dairy is a fine addition to your bone health regimen — if tolerated — but we urge you not to think of it as the centerpiece. And if you do enjoy dairy foods, we encourage you to choose those that are organically produced. You and your bones do not need the hormones, pesticide, and antibiotic residues found in conventionally produced milk — and organic dairy products are now widely available. So where can I get the best calcium supplement on the market today? 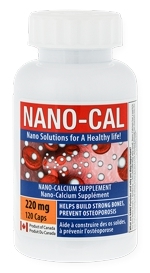 What a great question… go to shop.nanovatechinc.com and get started today or www.nanovatechinc.com to learn more about why our calcium is the best.